As a yoga teacher, have you ever had the following experience as you taught yoga to a private student or group? A yoga teacher sees their student in Adho Mukha Svanasana (Downward Facing Dog Pose), and their palms aren’t flat on the floor, and the weight is shifted to the lateral side of the hand. They cue the student to bring the palms to the floor. The biggest and most influential consideration is determining the right time to provide alignment cues or adjustments. Is it before or after the student has come into the pose? If you’re providing cues when the student has already come into the pose, it is too late. The student has already compensated their way out of alignment, and adjusting them after the fact will only cause more compensation. The key is to notice the compensation when it occurs and make the appropriate adjustments at that time, even if it means stopping the movement and starting again. Consider how you are watching your students. 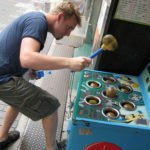 Oftentimes, the focus is on the end result, which is what leads to “whack a mole.” Watch your students as they move into the pose. Using the example of Downward Facing Dog Pose above, notice where and when the weight shift of the hands happens. It likely didn’t happen at the end position, rather it happened on the way to the end position. If you can bring awareness earlier in the movement, your student’s pace of progress will improve dramatically. This last point might not be well received by some. Consider that most yoga poses, while super cool and fun, are inaccessible to most yoga students. Most yoga students do not have the mobility, stability, strength, nor the control or coordination to be able to move many of the quintessential yoga poses (hence the Downward Facing Dog dilemma above). They can compensate well to get into the pose, but that level of compensation isn’t really serving them: it isn’t building their core, it isn’t helping them to release tissue or become stronger, and in many cases is setting them up for getting tighter and experiencing tension or injury. All is not lost. Once you shift the way that you are seeing, and what you are focusing on, the changes in your practice—whether as a teacher or student—will blow your mind. Tightness and injury created by your practice can be a thing of the past, and suppleness and ease will grow. 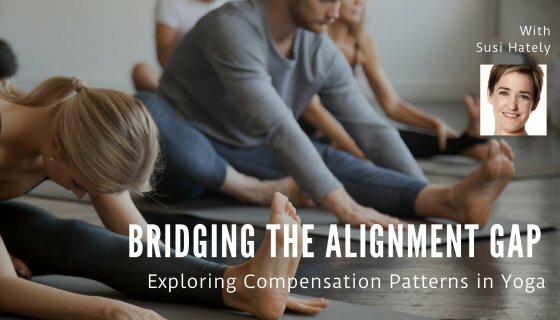 Study alignment with Susi Hately and YogaUOnline - Bridging the Alignment Gap: Exploring Compensation Patterns in Yoga. Susi believes that healing is possible. As a young student of yoga, she began to combine the ancient practices of yoga with her BSc.Kinesiology. She was working at a Vancouver pain clinic and all of her clients had persistent pain. They got better faster with Susi's integrative approach. As she continued to learn more about yoga, she was surprised by how many yoga teachers were in pain. Most viewed their pain as "normal". She began to explore how yoga was being taught and practiced. Since 2001, Susi has been on a mission to teach people that they can reduce or eradicate pain. Pain may be a normal physiological process. It doesn't have to be a normal way of life. And it isn't only people with pain whom she works with... She also helps people reduce autoimmune flares associated with lupus and rheumatoid arthritis. She supports clients recovering from surgery. Surgeons and post-op physical therapists are consistently impressed with how her clients progress. Susi's programs blend sound anatomical principles of kinesiology with the wisdom of yoga. This therapeutic combination settles pain and increases vitality for life. She's the creator of the Body-Mind Response Model, a tool that supports people in their own healing. Susi has also created the Integrative Healing Model. This tool supports the healing relationship between the health professional and the client. She's set a new standard in mind-body rehabilitation for helping people get well. Her programs have been studied at the University of Calgary. Doctors, physical therapists, occupational therapists, and massage therapists learn from her as well, and her trainees fly in from the US, UK, Greece, Caribbean, and Asia to learn her successful approach to healing.